May 16, 2014 (Signal Hill, Calif.) - Changeable wet and dry conditions greeted the drivers of the Formula Drift Pro Championship last weekend at Road Atlanta in Braselton, Georgia. Kyle Mohan, and his no. 99 GT Radial/Energy-X/Mazdatrix Mazda RX-8, qualified in 15th position before exiting the competition in the first round. Weeks after the season-opening event on the Streets of Long Beach, where Mohan had a heavy crash before advancing to the top-16, his rebuilt no. 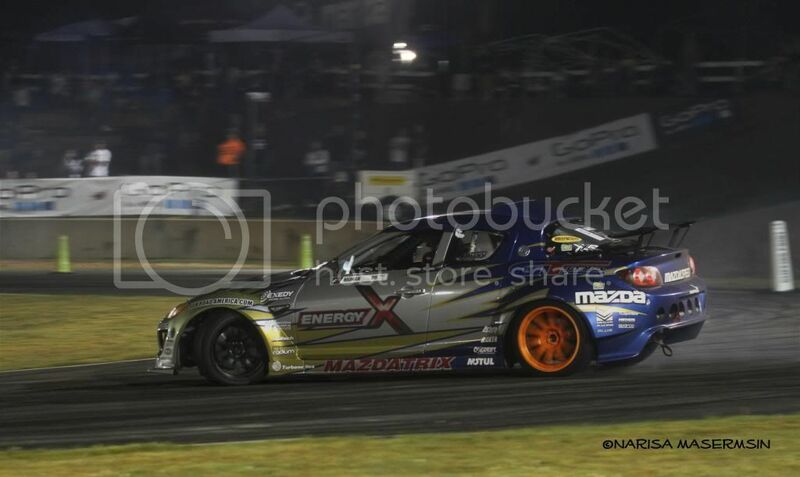 99 GT Radial/Energy-X/Mazdatrix Mazda RX-8 was ready for Road Atlanta. With additional power from the Mazdatrix built 20B three-rotor engine, and additional grip from his GT-Radial Champiro SX2 tires, Mohan found his car faster and easier to drive through Road Atlanta's tricky Formula Drift circuit than in previous seasons. In the rainy qualifying session, Mohan drove to a qualifying position of 15th, meaning he would face Darren McNamera in the top-32 round of competition. It was during the chase run that McNamera's car slowed much more dramatically than expected during the initiation, causing Mohan to slow his car more than he ordinarily would in order to not hit McNamera's car. Finally coming back to power, McNamera established a gap which forced Mohan to chase and try to close the gap entering the horseshoe. Carrying too much speed, Mohan dropped a wheel in the horseshoe. With the gap that McNamera established early in the run and the wheel drop, the judges advanced McNamera to the round of top-16. "I'm pretty disappointed in how this round went for us," said Mohan. "I felt we had a car that could have easily gone much further than the top-32, but between Darren slowing down more than I expected and dropping the wheel, the judges decided we shouldn't move on. Darren and I spoke afterwards, and he said that his car stumbled a bit when he tried to go back to power, and I had to slow down a lot so I wouldn't run over him. It's unfortunate that it happened, but things like this happen sometimes. We'll just shake it off and go for it in Miami." The next round of the Formula Drift Pro Championship is May 30-31 at Homestead Miami Speedway near Miami, Florida.